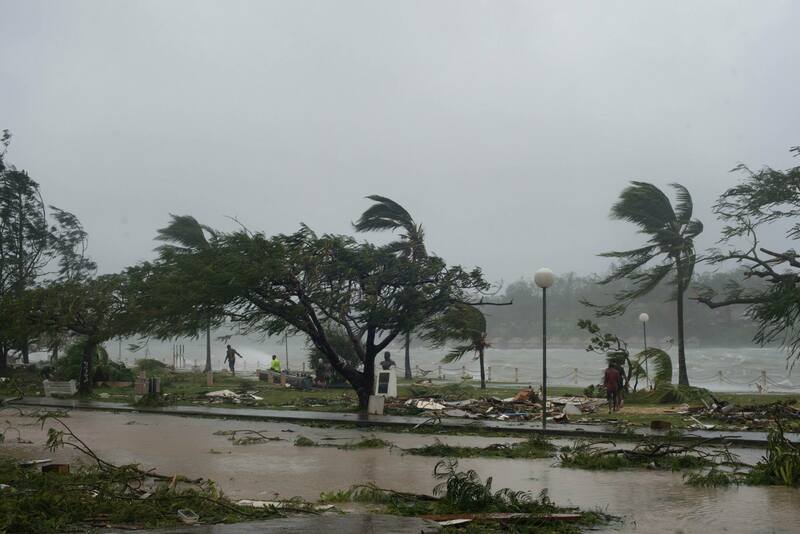 According to the best experts arriving on the scene virtually 90% of the living habitats for more than 250,000 people dwelling on the entire Vanuatu archipelago of 83 islands was wiped out by a Category 5 Cyclone (Hurricane) called Pam with wind speeds of more than 340 kilometers per hour (210 mph). In most cities and villages survivors have little or no clean drinking water. In our lectures over the past decade we have shown pictures on rising sea levels as a consequence of Climate Change, forcing many to momentarily settle in higher grounds as coastal areas continue to rise in the Pacific. Vanuatu is one of the many independent island nations which have been battling sea-level rise. However, Climate Change is more than sea-level rise, it is also severe storms which few governments have taken into account until now! “Water, Water, Everywhere, and Not a Drop to Drink” runs the old adage on the unpleasant situation of a Western person who is a survivor on a remote island surrounded by beautiful ocean water that is unclean and damaging. This is just as we saw in New Orleans during Hurricane Katrina, where clean water became scarce. In a special way, the adage can be used to explain a growing problem facing Western civilization with many leaders and educators unaware of the dimensions of Climate Change making its way around the world in growing super-storms, isolating whole nations unprepared for catastrophes that require Educational Awareness and Preparation! Leadership must move not only to try to reduce carbon emissions, but BE PREPARED for vast weather and Climate Change affecting all peoples around the globe. We need to start to see the bigger picture within the dynamics of Mother Earth and all planets of our solar system that are changing! To rethink what just occurred on Vanuatu in the Pacific Region requires everyone who can connect the dots to see something more than a passing event. The Vanuatu disaster requires a real change within our minds in marshaling the best tools needed for planning & sustainability within the human psyche! Summarizing UN Secretary Ban Ki-Moon’s words spoken recently to those gathered in Sendai, Japan, to commemorate Japan’s three-fold disaster (March 11, 2011), we must see that ‘investing in disaster risk reduction is very wise at this time’! send help to the people in the entire Archipelago around Vanu-atu. We feel Your Love and Know that these experiences will help awaken, eventually, everyone to the Cry of Mother Earth. Let us be better stewards of a Higher Plan of positive action so that small miracles happen.